Jayden Bogle in action for Derby. 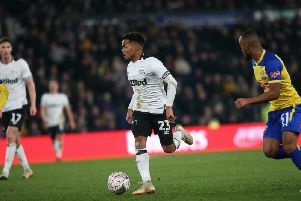 Jayden Bogle says it looks certain to be a close-run battle for the play-offs as Derby County prepare to face Blackburn Rovers tonight. The Rams lie just outside the play-off places with several clubs vying for the top five places. And teenager Bogle, who scored his first senior goal at Brentford on Saturday, is ready for the challenge. He told RamsTV: "We just have to keep pushing on. We have got a load of big games coming up so we just need to focus on them and take each game as they come. “Anyone can beat anyone in this league so if you’re not at it then it can be a tough game but I think we have to focus on ourselves and go into the game with the right attitude and right mentality and if we do that then we have a great chance of winning. Bogle was pleased to get his first goal for the club on Saturday as the Rams drew 3-3 in west London, having had several near misses over the course of the season. He said: "It was a great feeling. It is something that I have waited a long time for so there is a sense of joy and relief at the same time. It was a great feeling to score my first goal. “I did what I normally do with it, I drove forward and then the pressure came but I saw a gap. I then thought I’m just going to go for it and I ended up in the box. The Rams are at Ewood Park tonight to face Blackburn before hosting Bolton Wanderers on Saturday.